Yesterday the Dow Jones Industrial Average reached a new high, passing the 20,000 level. The NASDAQ index and the Standard & Poor’s 500 index also are at all-time highs. It’s an interesting milestone, and one that is very pleasing to the millions of Americans who have money invested in stocks or mutual funds. Investment in the stock market — especially through managed mutual funds — is one way the average American can put money away for retirement and (we hope) earn a decent return on our savings. Over its history the Dow has been pretty dependable in that regard, overcoming periodic drops and crashes and showing significant long-term increases both in absolute terms and on an inflation-adjusted basis. That’s why, if you’re taking a long-term view, financial planners will tell you that the stock market is the best place to put your money. These days, of course, there aren’t many alternatives for the average folks. The interest rates on CDs are a pittance, and the returns offered by municipal bonds and corporate bonds that used to be the bedrock of retirement planning aren’t very attractive, either. Investing in stocks in “emerging markets” seems pretty risky, too. Those are all forces that help to explain why the stock market has been on a prolonged bull market run that has seen the Dow triple in value since it hit its low point in the dark days of March 2009. Unfortunately, some Americans who might have shared in the Dow’s run-up got out of the market right as it hit its low point. Gallup has determined that, in 2016, only 52 percent of Americans adults have investments in the stock market, down from the all-time high of 65 percent in 2007. Obviously, many of those people bolted when the market crashed in 2008 and 2009 and they’ve never come back — perhaps because they are too afraid of another crash, or perhaps because they were so hurt economically by the Great Recession that they simply aren’t in a position to invest. Those who rode out the sub-prime storm, kept their heads, and kept their investments benefited. It’s a classic example of why anyone who invests in the stock market can’t try to time the market and has to take a long-term view that follows a long-term plan. 20,000 is an artificial milestone, of course, and we’ll no doubt see downturns in the future — but the stock market remains an important way for the average people to build their retirements and plan for the future. For those who are in the market, 20,000 is a welcome number indeed. It’s no secret that average life expectancy for men and women has been steadily increasing for years. With advances in medicine, science, disease control, and other factors that affect mortality, it’s now commonplace for people to live well into their 80s and 90s, and more people than ever are hitting triple digits. But if you read the occasional stories about the acknowledged oldest person in the world, you note that the maximums don’t seem to be advancing. You see the report on the oldest person being presented with a birthday cake with more than 110 candles, and a few months later you read that that person has gone to the great beyond and a new “oldest person in the world” has taken on that designation. This leads scientists to wonder whether there’s a natural limit to life expectancy in humans. One recent study, which explored a mass of human mortality information, has concluded that the human life span is naturally limited to a maximum of about 115 years, and that it would be exceptionally rare for any human to hit 125. The study noted that only one human, a French woman named Jeanne Calment who died in 1997 at the age of 122, has even come close. Some scientists pooh-pooh this conclusion, noting that the current crop of super-old codgers may have had their life expectancies affected by malnutrition or childhood diseases that have since been eradicated, and that up-and-coming generations of people who have not been exposed to such life-affecting circumstances may easily break through the 115 or even the 125 barrier. Others argue that extreme old age logically should have genetic limits, as the lives of different species of animals seemingly do. And, of course, it’s possible that new advances in medicine — such as finding a cure for cancer or the development of readily available artificial organs — could have an impact. For now, though, I guess we’ll just have to settle for going toes up in the prime of life at the age of 115. That’s bitterly disappointing for those of us who want desperately to see the year 2100, but at least having a presumed end date of 115 will add some welcome structure to our retirement planning. We all have to make some hard decisions in our lives, but one of the hardest is figuring out when to stop working. For some people, of course, there really is no choice, because they have not accumulated the savings that would give them the freedom to make a judgment. They simply have to keep working to survive. But if you have worked hard, and planned, and scrimped to put money away toward retirement, you ultimately will confront the issue of whether you have saved enough and can stop working, or whether, “to be on the safe side,” you should work a little bit longer and save a little bit more. It’s a tough choice because there are no easy answers and the consequences can be profound and, in some unfortunate instances, appallingly final. In one direction, you can retire too soon, see your nest egg take a hit in a “market correction,” and realize with a sinking feeling that you simply don’t have enough to have the kind of retirement that you hoped to have. No one wants to be a cash-strapped retiree who becomes a burden on their kids. But in the other direction, if you decide to keep working, you may be struck down, or left disabled by illness, and never have the opportunity to enjoy the fruits of your labors. Add in a few more moving parts — like whether you are someone who really enjoys your job and your co-workers, or whether you have incredibly long-lived ancestors or alternatively an apparent genetic predisposition toward certain disease, or whether you have family members who could use some help, or whether you are a worrier by nature and want to try to build enough of a cushion to provide complete retirement peace of mind — and the decision becomes even harder. It’s also a tough choice because you can’t help but be influenced by the personal stories of the people you know. A hale and hearty former colleague who is seemingly on the cusp of retiring dies suddenly, and you remember that one of the last times you spoke to him he was laying out his plan to work just a little bit longer before hanging up his spurs, and you shake your head and feel a chill. A new, older acquaintance explains that he had retired, went through the market downturn in 2008-09, realized with a sinking feeling that he had pulled the trigger too soon, and scrambled to go back to work and keep earning, and you shake your head and feel a chill. And then there are friends who develop serious health problems, friends whose siblings are in serious financial distress, friends whose spouses unexpectedly need surgery. The list of possibilities is endless, and each little personal story tugs you in one direction and then in the other. The most uncomfortable realization of all is that there is no magic calculation, no absolute certainty, and no clearly correct answer, and the consequences are huge. With the removal of the Mega Millions payout assumption, I need to look elsewhere for the wealth that will fund the fabulous, active retirement that is every American’s true birthright. 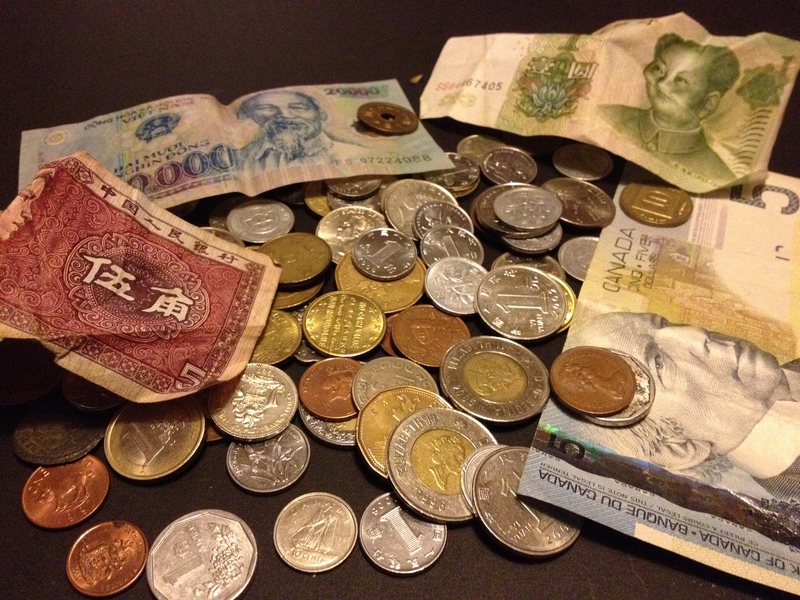 Recently, in doing some spring cleaning, I think I found my answer — in our travels, we’ve accumulated an impressive collection of foreign money. Why, I have one piece of paper currency alone, with a picture of Ho Chi Minh on the front, with a face value of 20,000 dong. 20,000 dong! If the exchange rate is even remotely favorable, that one bill alone should fund a year’s worth of Early Bird Specials at whatever restaurant caters to senior citizens at our ultimate retirement destination. That’s not all, either. I’ve got a 1 yuan bill with Mao’s picture on it, as well as Chinese coins. Another bill reads 5 Wu Jiao and has a nice picture of two women wearing some traditional tribal costumes on it. It’s probably Chinese currency, too. China’s economy is doing great, so that hoard will be like an investment that will keep on growing. I’ve got Euros, and Canadian change, and coins with holes through the middle and Asian writing on them. Surely, all of those will be worth something, and will help to avoid times of want in my golden years. As I go through the money, I found one game token that has “no cash value” stamped on it. Oddly, it looks just like the other coins — made of metal, about the same weight and heft, minted with a picture on one side and numbers on the other. I suppose you could conceivably confuse American currency with such worthless bits of metal or paper. Fortunately, our money has the full faith and credit of the U.S. government behind it. Thank goodness!